Welcome to Eye of the Beholder's contribution to the Northern Woods Blog Hop! Enter to win free patterns and fabric bundles. Keep reading to find out how. 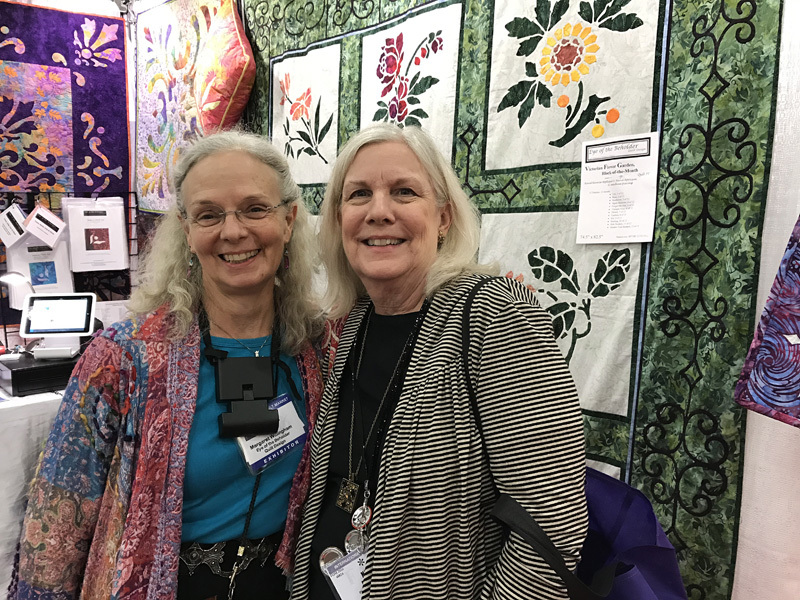 Any tasty quilt treat is the perfect combination of relationships between people, fabrics, color, design and timing! Yorkshire Pudding, table runner XII proves my point. 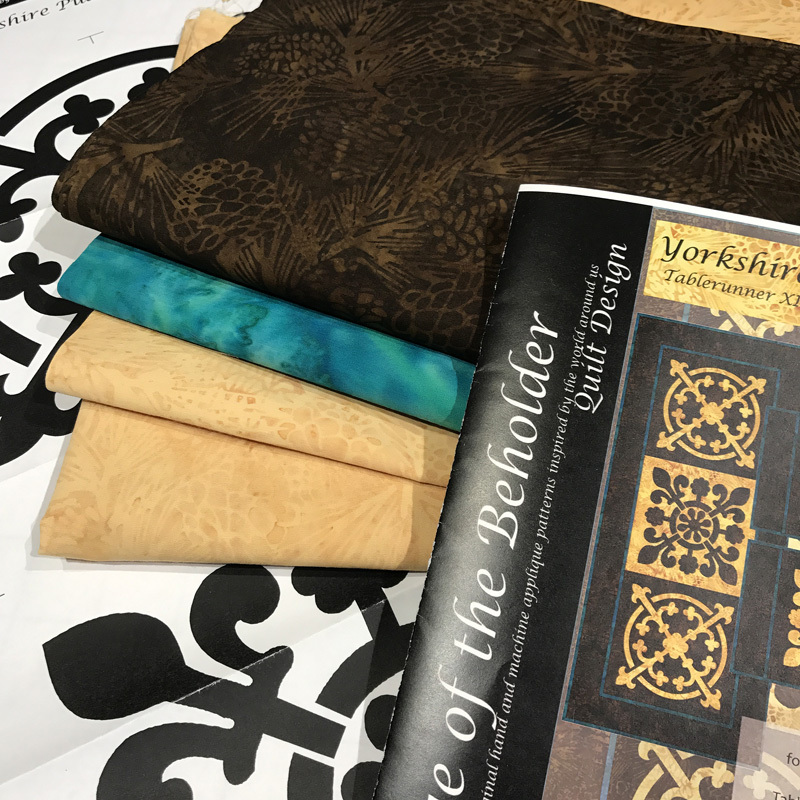 Our Yorkshire Pudding table decor set was created from Northern Woods, the signature collection of Nan Baker of Purrfect Spots, for Island Batiks, fall 2017. Now these fabulous, yummy batiks are ready for you to create with! I first met Nan in 2016, and I met her because of our longstanding pattern design relationships with Island Batiks. Don't you love connections? 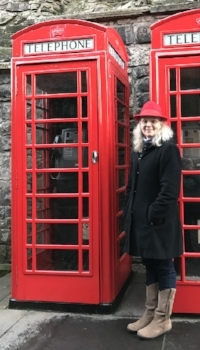 British classic in my new red hat. Houston ended. I headed home and then immediately flew to NY for my Dad’s funeral. Home again for Thanksgiving followed by a long planned trip to England and Scotland to visit my daughter and son-in-law. My daughter and I saw the sights of Leeds, traveled to York to see Castle Howard and attend Evensong at the York Minster, and then ventured to Edinburgh, Scotland to experience the Royal Mile encompassing St. Giles Cathedral, Edinburgh Castle and the Writer’s Museum then to the coast for Royal Britannia and back into town for a gluten-free high Tea. All the while laughing, talking and savoring every minute together. 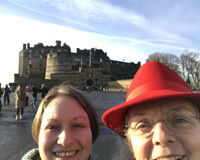 Selfie in front of Edinburgh Castle. Everywhere I went I was inspired! 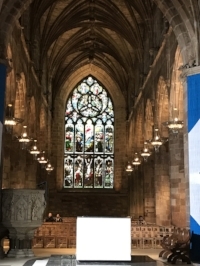 Gothic flying buttresses, stone tile floors, carved columns and ogees, gorgeous stained glass windows. 14 days later armed with at least 1,000 pictures, I returned to the states. I had tons of creative inspiration for future quilts. I didn’t have to wait long to use this creative material. As 2016 turned the corner into 2017 Nan told me of her Northern Woods signature collection with Island Batiks, and invited me to submit quilt project ideas using her fabrics. Ceiling of Castle Howard, York. 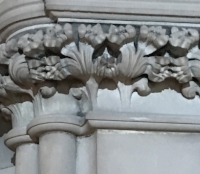 Stone carved column top, Leeds. 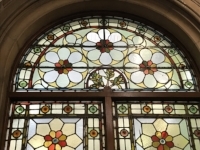 Stone & wrought iron railing, Leeds. 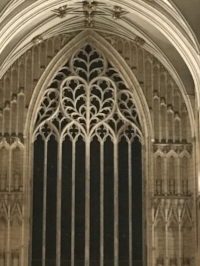 Stone frame of stained glass window, York Minster. I’ve been designing patterns for Island Batik since 2015, and am continually inspired by the colors, fabric designs and the consistent quality of their batiks. They are a dream to stitch with by hand or machine. I was honored by Nan's design invitation. The designs would premiere at Houston Market 2017, 10 months away. I love a design challenge! Nan's and my quilting designs are very different. I’m all about reverse applique and she is all about piecing. We are drawn towards different colors. She loves earth tones, like her yummy signature collection, and I’m drawn towards jewel tones with sharp contrast. But we respected and appreciated each other’s work, and as I said earlier, we liked each other. I culled through my pictures and began to design, first with paper and pencil and then using EQ7. I settled upon two floor tile designs that I found across the pond. 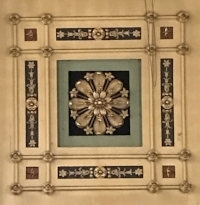 The tiles were Minton tiles. 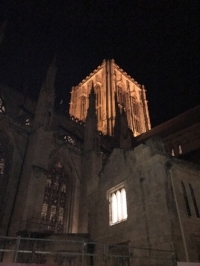 I found one of them in both the York Minster, England, and St. Giles Cathedral, Scotland. 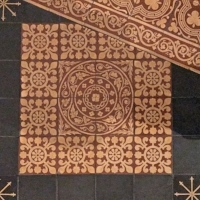 I transcribed the tile designs to make them suitable for fabric and able to be made by hand or machine reverse applique, and considered the block sizes. I wanted this project to be fun and easy to make. Too small and the design elements would make it difficult. Too large and the design would lose its appeal and the projects would be big. I created possibilities without fabric. In February I received all 24 of the digital fabric images from the Northern Woods collection. The fun of adding color could begin! The colors were different for me to design in, so it offered an exciting challenge. I immediately fell in love with a deep, rich chocolate brown (sku: 121723090) and a butterscotch gold (sku: 121723040) with accents of Teal (Bermuda, from Island Batiks' basics collection). By time I was done I had designed 20 quilt possibilities, all in varying sizes and colorways. I sent a variety of my #1 choicest designs onto Nan and Island Batik, and awaited for their decision. They had the hard job of selecting the projects not only from my design offerings, but also designs from other designers. They had to figure out an assortment of projects by size and look that highlighted this beautiful batik collection. The pillow that got away. Place mat that was chosen. The quilt that got away. The table runner that was chosen. 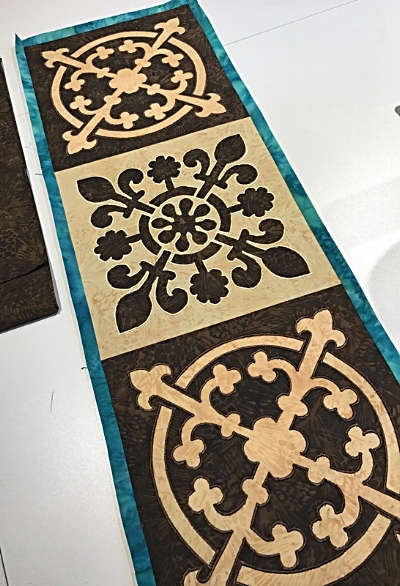 one of the Celtic stencils I used by The Stencil Co.
My Northern Woods fabric. Excited to begin. By March I had Island Batiks’ decision. 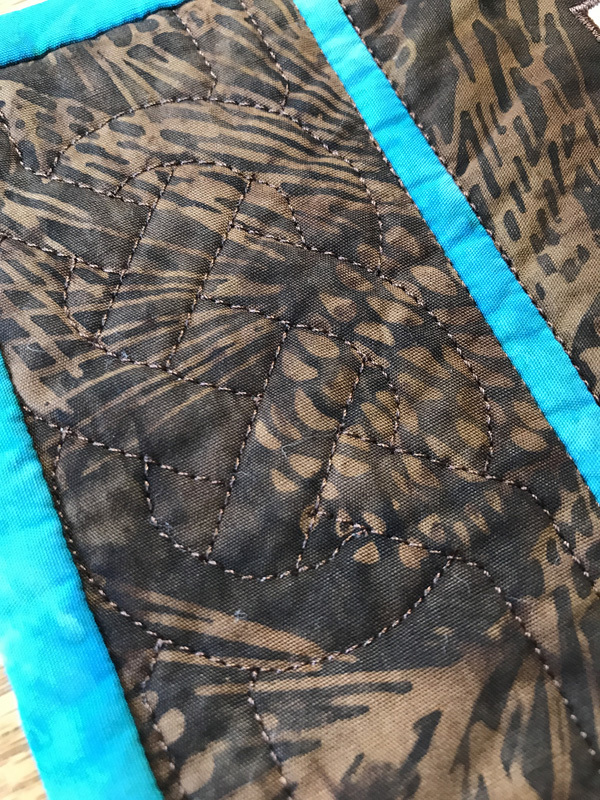 While waiting for my batiks to arrive, I wrote up the pattern for hand and machine reverse applique and dreamed about how to quilt my pattern design. I wanted Celtic style stencils and found some perfect ones from the Stencil Co.
On April 22 my Northern Woods "Christmas" present finally arrived: a box full of yummy batiks. There is nothing like seeing the fabrics in person. Digital images are a helpful tool, but they never quite capture the true beauty of fabrics. From the beginning my chosen batiks brought to mind chocolate and butterscotch pudding. Now, looking at the fabrics, I was hungry. I could just taste the richness of the chocolate and butterscotch, just looking at them. 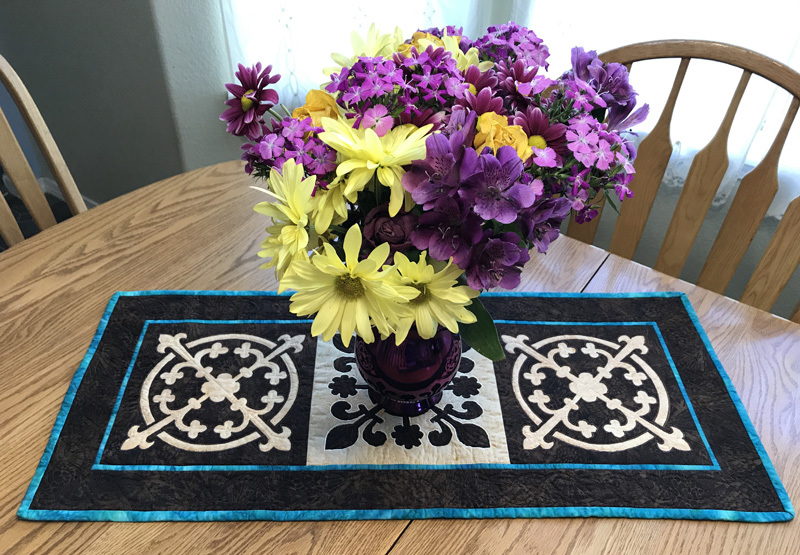 Pieced table runner with inner borders attached. The next round of fun was about to begin! I love actually working with the fabrics. They feel delicious in my hands as they turn from pieces of cloth into designs…into quilts. I always start with my hand versions. It’s a tactile experience in which I become intimate with my designs. And I get a thrill every time. As I hand reverse needle-turn applique I love experiencing a new design coming to life. Its only then that I really know if a design "works". I stitched away, first by hand and then assembling by machine, creating the table runner and four place mats. I was ready to make my quilt sandwiches and try out those Celtic stencils I ordered in. Quilting in the reverse applique. Quilting of Place mat sides. Don’t you love the texture that’s created when you quilt? Even using matching thread on dark fabrics, the quilting, subtle though it may appear, gives life to the piece. Next I turned my attention to thereversible napkins. Teal on one side and butterscotch on the other side to compliment this table décor set. Yorkshire Pudding table decor set. But what to name this new creation? Naming my quilts is typically the last step for me. (It was the same with the dances I choreographed.) Only when something was done would the name present itself. I considered the yummy elements: Rich browns + golden butterscotch + sweet, creamy pudding + designs from Yorkshire England + a classic English food + A play on words = Yorkshire Pudding. Yorkshire Pudding table runner XII*, where Britain and America meet for a yummy quilted treat! Leave a comment below to be entered to win 1 of 3 FREE Yorkshire Pudding patterns! 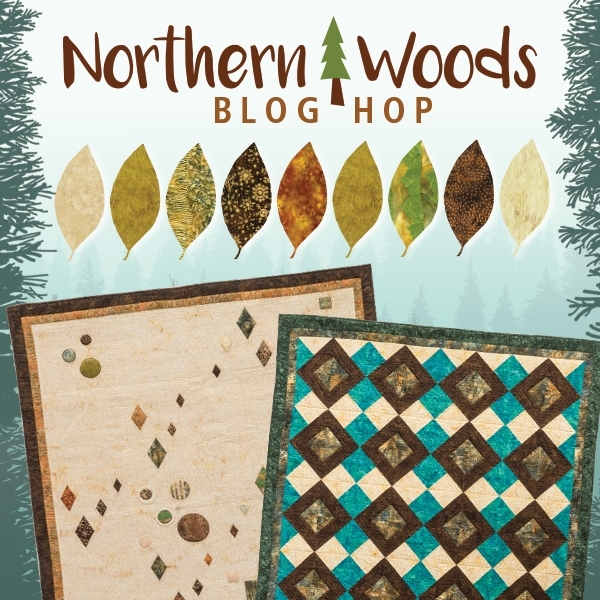 Check out Island Batik's Blogs to and enter a giveaway of Northern Woods fabric bundles. *Disclaimer. Classic Yorkshire pudding has nothing in common with American pudding. It is a batter pudding rather than a dessert. So, what is Yorkshire pudding? When wheat flour began to come into common use for making cakes and puddings, cooks in the north of England devised a means of making use of the fat that dropped into the dripping pan to cook a batter pudding while the meat roasted. If you want to make a classic Yorkshire Pudding, click on the recipe, and enjoy. Best Yorkshire Pudding recipe. If you want a yummy American Chocolate pudding, click on this recipe. Homemade Chocolate Pudding.